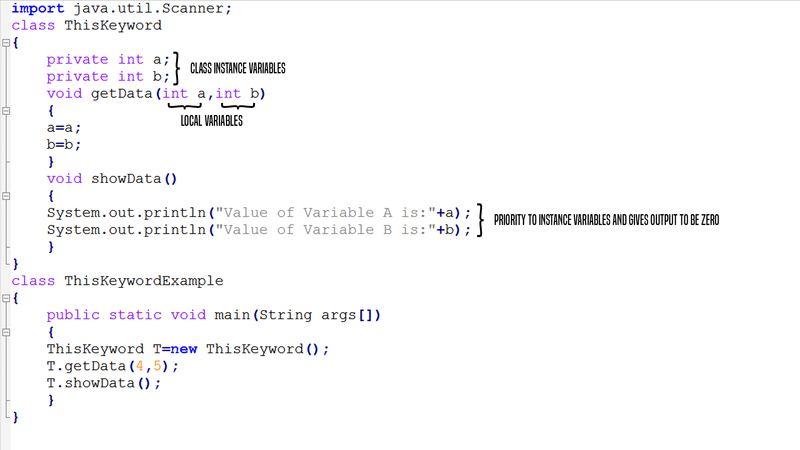 Learn: this keyword in Java, in this article we will learn about this Reference, how it can be used when both the Member Name and Parameter name of any method are same. this is an Object which holds the Reference of another Object which invokes the member function. the body of getData() method the compiler is confused whether it should give priority to Instance Variables or to Local Variables and that is why in the showData() method , Compiler give priority to the Instance variables and give output equal to zero. Thus, T.a is the instance variables and a is the local variable as defined in the getData() method's parameter. Let us consider another example Where we will be using this keyword differently. Our main aim in the following program is to find out who is Elder in Age among two Persons, we will be implementing this program with the help of this keyword.